I’ve been digging through my old original comics archives, selecting artwork for upcoming exhibits at the San Francisco Cartoon Art Museum and the Betty Boop Festival in Wisconsin Rapids, Wisconsin. This old gem, while not one of my best, has extra sentimental value. “George the Monster,” who featured in early Nina’s Adventures strips, is my longtime friend Ian Akin. Remarkably, we’ve stayed friends almost 22 years. In fact Ian is visiting me in New York right now! I’d forgotten all about this song he wrote for me when I was fighting some battle or other in my 20’s. Upon rediscovering it, I found it’s just as cheering as I fight some battle or other in my 40’s. Although the comic says ©, it’s now copyLeft like all my old comics. CC-BY-SA. An excellent new 16-minute documentary by Marine Lormant Sebag about Free Culture, Sita Sings the Blues, and me. Please watch it – it’s good and it explains a lot! The Revolution Will Be Animated from Marine Lormant Sebag on Vimeo. Why should techies have all the fun? The few publishers to embrace open content focus primarily on technical books. But an increasing number of artists and pop culture creators are seeking alternatives to copy restricting their works. What works for Cory Doctorow’s science fiction can also work for graphic novels, art and coffee table books. Unfortunately, publishers that historically specialize in popular culture – many of which are subsidiaries of the same media conglomerates pushing DRM and extending copyright enforcement – are unwilling to pursue the open-source model. Will existing open-source publishers expand into pop culture to exploit this niche? Will new publishers emerge to serve both pop culture markets and artists? I’m making a power point (excuse me, keynote) presentation and everything. 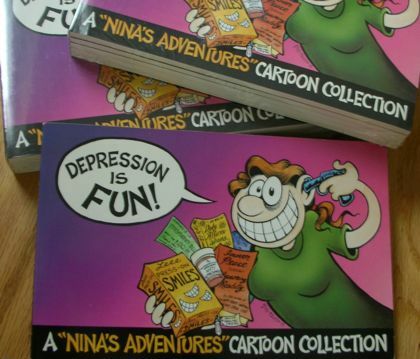 You’ll be handling 14″ x 11″ rare, original, one-of-a-kind Nina’s Adventures drawings, in various stages of decay. Some are turning yellow; some have faded ink; some have corrections and edits pasted on, the glue of which has ceased to adhere so now bits are falling off; some were drawn on “fade-out blue” graph paper which must be edited out of scans. Once these puppies are scanned and uploaded, they’ll be free for anyone to copy and use. Publish them anywhere! Make buttons and t-shirts! Make that coffee-table book I’ve always wanted! Make derivative works! As long as you attribute the source to me, and license the derivative works under the same share-alike license, you can do whatever you want. But we have to get these scanned and uploaded first, or the revolution will never come. “But Nina, how will you make money?” Hopefully by selling originals. The more freely the images circulate, the more valuable the originals will become. 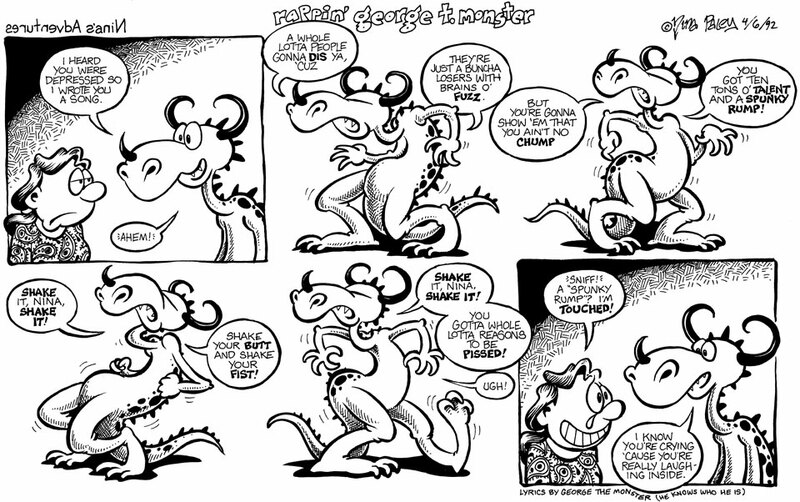 To this end, I could use another volunteer to help build a web site cataloging all the original strips, both available and sold. It would be nice to allow owners to add their contact information, and otherwise track the locations of all the originals as they go out into the world. Maybe you could manage online auctions or something. And shipping…boy do I need help with shipping. Potential volunteers please comment below or send an email to nina underscore paley at yahoo dot com. Thank you! Update: all 10 copies are now sold or spoken for. When I recently visited San Francisco, my best friend Ian picked up the last of my boxes stored at the old apartment I once shared with my ex-husband. Riffling through the contents I discovered a treasure-trove of still shrink-wrapped copies of my first book, Depression Is Fun. This has been out-of-print almost since its publication in 1992. But now I have 10 copies here in New York, and they’re on sale for $25 postpaid (and signed, if you want) each. These puppies are going for $30, $50, and – holy crap! – almost $90 online as “collectibles.” As always, my email address is at the bottom of the middle column, the one with the pictures linking to my movies and cartoons and stuff.